During our time at SXSW, we partnered with RIoT to extend the “Raleigh” story while on the ground in Austin, Texas. Our partners at RIoT were the ultimate content “gurus” at SXSW. They attended several sessions, networking events, and joined us at the booth to talk with attendees about our mission to share our community with SXSW’s global audience. 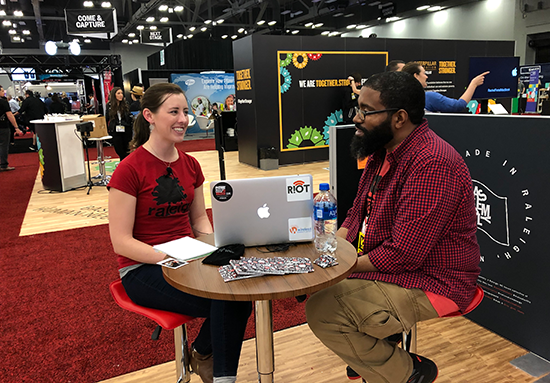 Several of our SXSW team members joined Dr. Sarah Glova, director of growth and communications on the RIoT podcast, to talk about the impact and benefit SXSW has for place-based booth activations. You can listen to the podcasts here featuring Jenn Bosser, senior business retention and expansion manager for the City of Raleigh, Danya Perry, director of equitable economic development at Wake County Economic Development, and Loren Gold, executive vice president at the Greater Raleigh Convention and Visitors Bureau.